Description A collection of materials related to the life of Sol Schulman, entrepreneur and businessman in Sylva, NC. Relation Choosing to Remember: From the Shoah to the Mountains, D.H. Ramsey Library Special Collections, UNCA ; Leo Finkelstein Oral History in the Voices of Asheville Oral History Collection, D.H. Ramsey Library Special Collections, UNCA ; Samuel Robinson Papers (1891-1973), D.H. Ramsey Library Special Collections, UNCA ; Beth HaTephila Congregation (Asheville, NC), D.H. Ramsey Library Special Collections, UNCA ; Eliada Home Archive, D.H. Ramsey Library Special Collections, UNCA ; Sidney Schochet Family Papers, D.H. Ramsey Library Special Collections, UNCA ; Carolina Center for Jewish Studies, UNC Chapel Hill ; American Jewish Historical Society ; "A Portion of the People: Three Hundred Years of Southern Jewish Life," Documenting the American South, UNC Chapel Hill ; The Family Store Project: A History of Jewish Businesses, 1880-1990, a 12-panel exhibit displayed in a variety of locations in downtown Asheville in the fall of 2006 by History @ Hand. Rights Restrictions apply: Permission to publish must be obtained from "History @ Hand Partnership," contact: 828 253-0982. Copyright retained by the authors of certain items in the collection, or their descendents, as stipulated by United States copyright law. Biography Sol Schulman was born March 15, 1912 in New York, New York. He was the youngest of eight children born to his parents, Lithuanian immigrants. Sam, his father, was a cutter at a garment factory, and when Schulman's mother was hospitalized he was sent to live with an adult sister. He was eight years old when he left to live with Rose, her husband, and their firstborn child, Aaron. At an early age he was required to assist his sister and her husband who ran a clothing store in Orangeburg, South Carolina. Rose's family moved to Thomasville, where the family stayed. When Schulman was twelve his father moved to Reidsville to open a store and Schulman returned home to move with his father to the new town. 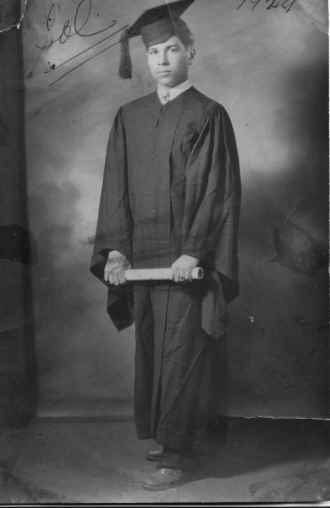 He graduated from Reidsville High School in 1929 and while in school continued to help his father in the family business. The two of them moved to Cherryville after Sol’s graduation to start another store. During the Great Depression Sam, the father of Sol, and two of his daughters invested in real estate, and as part of that investment in 1932 they built a store in Sylva, near Waynesville, North Carolina. They were unable to find renters for the building, and after it sat empty for six months Sol was sent to Sylva to either find a renter or sell the building. After being in the area a short while Sol decided that he liked the area and people, and that he would rent the building from his father himself. Despite protests that the Depression era was not the time to start a store, Sol opened a clothing store selling goods at a higher quality than were in the area. Local businessmen said that he would not find enough clientele, but he did well. During his first year Sol stayed in hotels and worked on getting his store off of the ground. Several times he journeyed to New York City Merchandise Market to purchase goods for his store. On one such trip he met Lillian, a distant cousin with whom he had never had much contact. Lillian had left Lithuania in 1922 with an older sister and younger brother to settle in New Jersey. The couple enjoyed a slow romance, and in 1937 the couple was married in New York. Lillian moved to Sylva with Sol. In 1942 Herbert, their first son was born, and in 1948 David was born. Sol encouraged strong work ethics in his sons, and they were expected to work in the store once they were old enough. Sol and Lillian wanted their sons to work in jobs other than retail, and encouraged them to attend college. Herbert went to the University of Georgia, and after a stint in the National Guard came home to work for his father. He stayed full time at the store from 1954 to 1978, when he started his own stamp collecting business. David also stayed in retail and at the age of 23 started his own clothing store aimed at the younger crowd. Lillian died in 1981, a loss that was devastating to the family. Sol continued to run his business despite increasing corporate pressure that forced David to close his chain of stores in 1991 and turn to real estate for an occupation. Sol was eventually forced to close his store in 2002 due to Parkinson’s disease. He left behind a large community of people who remember the man and his store. Sol died November 10, 2002. He is remembered in the book The Man Who Lived on Main Street, written by historians Sharon Fahrer and Jan Schochet. Sol had planned to be at the book signing at City Lights on October 5, 2002, but instead it turned into a celebration of his life. A portion of the profits were set aside for the continued improvement of downtown Sylva.